The Rescue Squad is a volunteer organization staffed by Daleville Department of Public Safety employees, city employees, and volunteers from our community responding 24 hours a day 7 days a week. Contact us by calling 334-598-4442. 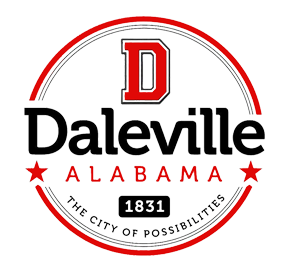 The Rescue Squad provides Basic Life Support (BLS) rescue and ambulance service within the city limits and police jurisdiction of the City of Daleville and to the Town of Clayhatchee. CPR is a life-saving combination of timely chest compressions & rescue breathing delivered to a person who is not breathing and/or whose heart has stopped beating. Research clearly shows the sooner someone receives CPR and defibrillation from an AED after going into cardiac arrest, the more likely they are to survive. As an emergency medical service, we look to the community to help us by becoming trained in CPR and learning how to use an AED. A simple four hour class can do so much when seconds truly count. Show someone you love them, learn CPR. It is our belief that all members of the community should be certified to perform CPR (Cardiopulmonary resuscitation) and know how to use an AED (automatic external defibrillator). Daleville Resuce is an American Heart Association (AHA) training site. Whether you are an individual in the community, a medical professional, or a business owner looking to train your employees in CPR, our staff will work closely with you to setup a training program that allows you or your employees to help others in their time of need.